It was a 2-fer, a great event in a great space. I went to the opening of "Groundstory." at Agnes Scott's Dalton Gallery last Thursday night. The Dalton is in Dana, one of my favorite places especially at night. Follow "Dalton Gallery of Agnes Scott College" on Facebook to learn more. The Charles A. Dana Fine Arts Building at Agnes Scott College was designed by Edwards & (John) Portman and dedicated in 1965. Wherever you come down on John Portman, you might enjoy the Dana. It's clever, it's fun, and it takes whatever the students dish out. Let me give you a hint of Dana at that night. Dana is a modern that echos Agnes Scott's university Gothic style. It's a classroom, studio, and office building that happens to contains galleries, a theater, surprises, and a lived-in look. The Dalton Gallery crowd has a personality of it's own: fans like me, artists, professors, students, "Scotties" and "Decaturites." It was shoulder to shoulder and lots of folks knew each other. Groundstory had more than I could take in one visit. "Louis Tugs a Tug" by Gina Philips got a lot a attention. I want the "Terry Tugs a Tug" a tug version.. There's a charming short movie, "There's No Place Like...," by Benita Carr and Bill Orisich. Don't miss the levitating ladies. Stefanie Jackson's four (five?) large paintings bowled me over. There's much more but this post is about Dana at night. The gallery was closing but once outside I didn't want to leave. The view changed with every step..
"Groundstory" runs until November 17, 2012 . 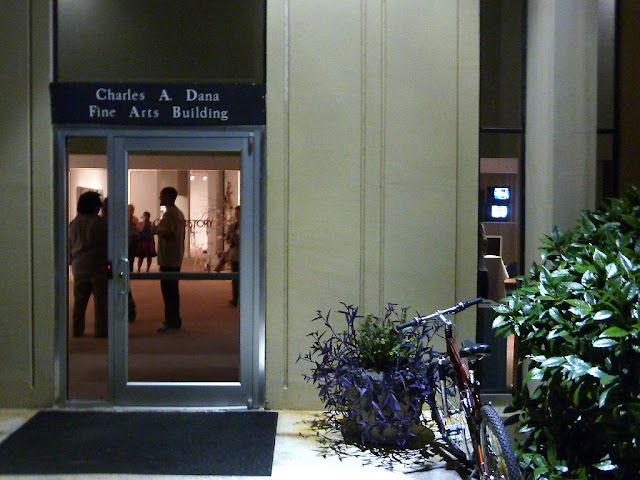 Follow "Dalton Gallery of Agnes Scott College" on Facebook. I never thought I'd see inside of Prince Hall Masonic Building on Auburn Avenue. I've been driving by for decades. It always caught my eye just two blocks west of Ebenezer Baptist Church. And I always thought it was Prince Hall, as in a "hall" named prince. Really! I had no idea until a few weeks ago. Was I the last person to find out? This building contained the headquarters of the Southern Christian Leadership Conference. Dr. Martin Luther King, Jr. and Ralph David Abernathy, Sr. worked here. On the Old Fourth Ward Tour of Homes tour map it was just "300 Auburn Avenue," a modest caption for an important place. Thanks to the tour I can show you a little bit of the inside. Prince Hall Mosaic Building, 1937, designed by Charles Hopson and Ross Howard. First: Prince Hall was a person. A bit about the building. There's a daylight terrace level, two office floors, the masonic lodge is on the 3rd floor. You enter the building proper from Auburn Avenue. This is the lobby / stair tower / elevator lobby looking out to the main entrance on Auburn Avenue. Though empty now the first floor was SCLC Heaquarters until 2007. Dr. Martin Luther King's office was in this space, roughly where these folks are standing. For security reasons Dr. King's office didn't have a window. Vann Hall (dark blue shirt) gave the SCLC tour. He worked there back in the day. The second floor housed working offices. We didn't tour there. I wasn't prepared for third floor, for the masonic lodge. It has terrific proportions, arched ceiling, clerestory windows, classical detailing. But it's not precious, not fragile. Folks have been meeting there for decades and you could sense that. This is a space that makes people feel important, my favorite kind of room. I don't know what you call these rectangles with indented corners but they required interesting brickwork. The motif repeats inside the lodge. 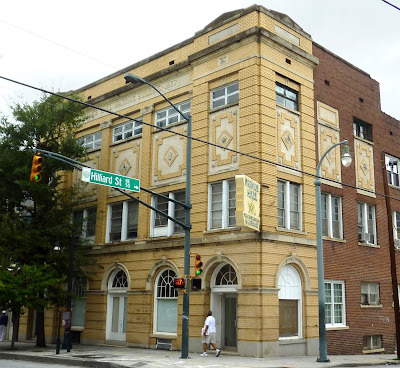 Prince Hall Masonic Building is the 4th Hopson design that I know of in Atlanta. All are favorites of mine. Rock Springs Presbyterian Church is the design highlight of Piedmont Avenue. don't you think? The St. Paul's Presbyterian Church steeple on Ponce de Leon has brickwork galore. Peachtree Christian Church is an Atlanta Landmark, and that's just the outside. Hey, we found a new rainbow row last Sunday at the O4W Tour of Homes. It's Lampkin Street Cottages by McConnell Homes. We Architecture Tourists are always on the prowl for rainbow rows. I developed my crush when I first saw Charleston's Rainbow Row on a childhood visit with my parents. 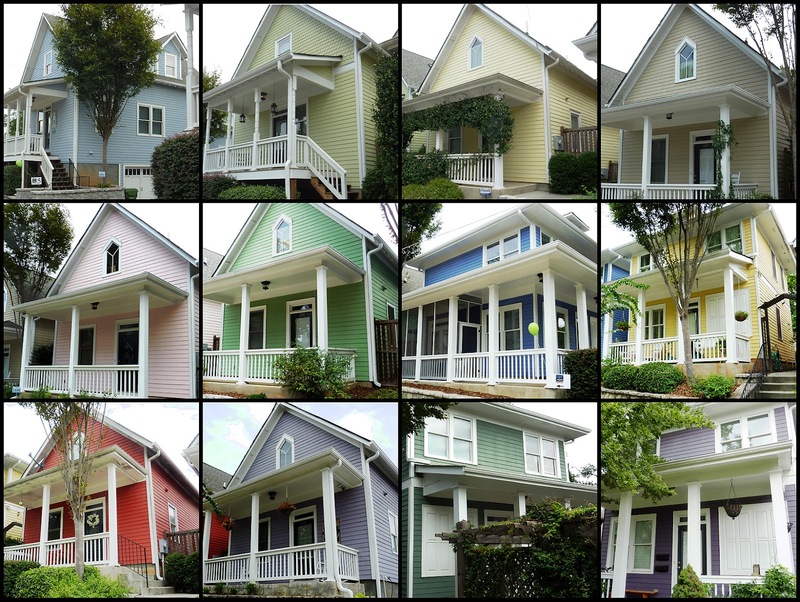 We've found a few in Atlanta too: Highland Avenue's Rainbow Row, A few surprising blocks: 11th Street in Midtown Atlanta, and Rainbow row in Candler Park / Little Live Points. They have a secret back there. Thanks to everyone for the very first OFW tour of homes. Know of more rainbow rows? Please let me know. There no getting abound water damage, even a hundred feet up. This is First Baptist Church, Decatur by Ivey and Crook Job #513, commissioned in 1948. I drive by twice a week It's big church south of the Dekalb Courthouse. I like it better up close than at a distance. It's more chunky than delicate. The second "layer" of the steeple is a Buck Crook trademark, a temple by itself. They've been repairing water damage since spring. See "Classical rot managment in Decatur. Where does the water want to go?" 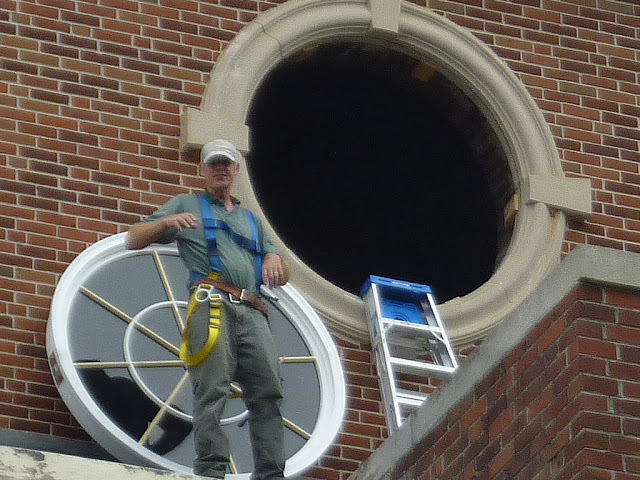 This week they did windows, 3 big and one small. The new windows look modern from the backside, the inward facing side. Looks like stick-on muntins. You can see old trim parts on the left. Let's have a cheer for modern lifts. I was too busy to watch for long and anyway it makes me a bit woozy. The men worked safely but my brain imagined falling. They were done in a day. Is this most eye-catching building in the Old 4th Ward? It was love at first sight for me but I thought we'd never meet. It's on Sampson Street two lots north of the Irwin Street Market, almost in sight of Studioplex, next door to MINT Gallery. But you can find it with your heart. 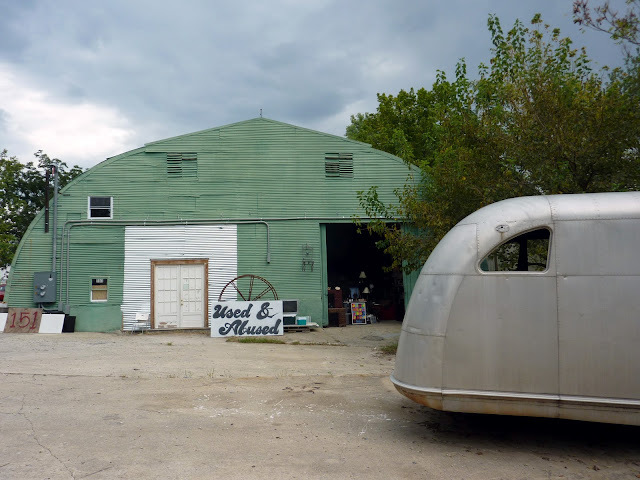 What a composition: Oversize green Quonset hut with Airstream. I'm not sure it's a bona fide Airstream or genuine Quonset hut but who cares. Tax records say it was built in 1950; it's my age. I got a tip, got lucky. We architecture tourists make our own luck. Yesterday just happened be the very first Old Fourth Ward Tour of Homes. One of the tour's home owners suggested I visit the hut because Mitch was always there. Wow, it's even better on the inside. Mitch said, "yep." 5,022 square feet of burning love. And you know what? The back is as pretty as the front. The back door is smack on the BeltLine a stones throw from Kevin Rathbun Steak. If all goes well, this may become a million dollar view. In the meantime you can enjoy the inside, enjoy the outside, and pick up your sticker. And say hello to Mitch. He's got some crazy stuff in there so bring a few bucks.